Christmas day with only three other family members was a weird experience. Normally there's at least 237,936, all shouting at once and demanding more turkey. So this year I got the leg and delicious it was too. So it's been nearly two days and now the realisations are setting in. I now have two scarves which means I have a choice in the morning about what to wear. I don't want choice, it scares me. Me and my brother both got mp3 players, his has been charging since yesterday and still shows no sign of having a full battery, mine takes an AAA battery and I've been using it all day cos I can. I'm a nice sister. Anway the point of this entry (the point is…?) 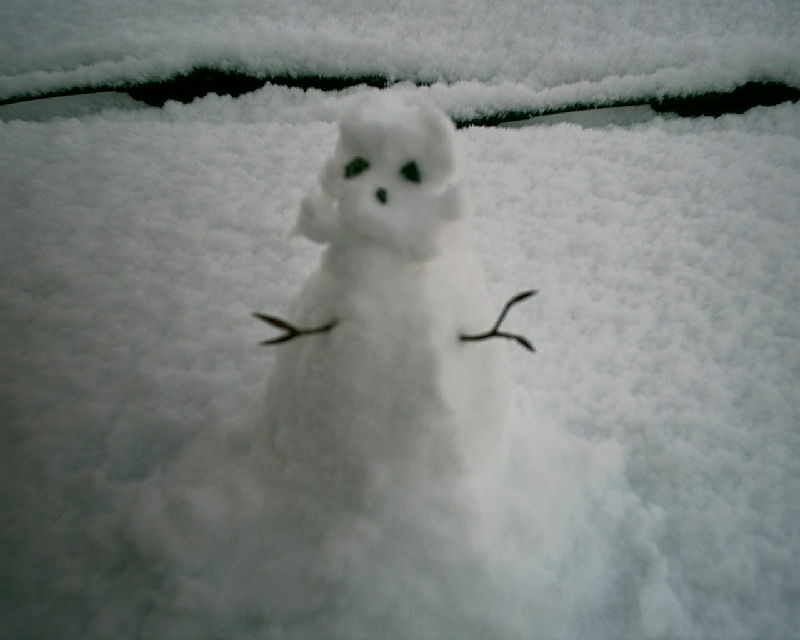 is too show off my new gallery of lovely snowy pictures, called, imaginatively Snow. It snowed here which it rarely does at Christmas and this made the landscape magical, driving dangerous and my life cold. Me and mum had to drive to Liverpool so she decided I could de-ice the car whilst she sat in it with the engine on and heater going. The small, hand held ice scraper was never going to win against 2 inches (5cm) of fine, dusty snow. All I was doing was moving it around the car. So I got a brush instead and acted like a curler on speed. Car clear and off the Liverpool. So here's a preview of Snow. He's so cute, yes he is. Aww! I want one! Please bring him back to Warwick with you so we can all admire the little ice guy. Lucky you, we didn't get anything more than freezing cold weather and frost. Yeah, no snow in smelly Scunthorpe. Just rain. And wind. And other cold things that are no fun.